Can a chubbier frame buffer give the HD 7790 a competitive edge? We're straying into the faintly awkward territory of frame buffer capacity here. How much video memory do you actually need, and how little can you really expect to get away with on a fairly entry-level graphics card these days? These are the thorny issues we'll have to contend with in reviewing a slightly chubbier version of AMD's Radeon HD 7790. This 2GB version from Sapphire is essentially just that standard reference card, only this time with double the frame buffer. By extension that means this card is using the same stock-clocked Bonnaire XT GPU, with its 896 Radeon core count and 1,050MHz clock speed. Sadly, that also means it's only sporting the same limited 128-bit memory bus as the standard card, and that's what's really holding this card back on the VRAM side - not the memory capacity. 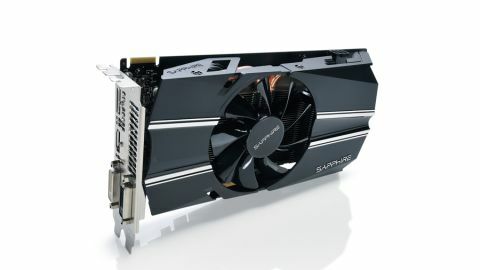 The card it ostensibly replaces is the end-of-life Radeon HD 7850 1GB, a card that was doing incredible things in terms of gaming frame rates with a single gigabyte of GDDR5, so you can see the damage having a weaker GPU and memory bus does to gaming performance. But we've gotten over the disappearance of the HD 7850 1GB card from the production line, mainly thanks to Nvidia's recent efforts in the same price bracket. The GTX 650 Ti Boost card it recently unveiled is definitely channelling the spirit of the deceased card, offering performance way above its price tag, and therefore well above that of the competing HD 7790. The GTX 650 Ti Boost is more expensive than even this 2GB version of the HD 7790, but only by just over a tenner, and the performance benefits easily justify that extra expense. That card is also running with a 2GB frame buffer, but the superior GPU and wider 192-bit bus allow it to remain ahead of the AMD card in all but the DiRT Showdown benchmarks. So, dear readers, have you been wondering why we haven't compared this 2GB card to the original 1GB version? Well, that's because the extra capacity frame buffer makes little difference in pure gaming terms, especially comparing it to the cheaper and slightly overclocked Dual-X version from Sapphire. So what's the extra memory doing? Well, because of the weak memory bus, it's not doing anything to help push things along any quicker. What it is doing though is pushing up the minimum frame rate. Well, it's pushing it up a bit. That difference isn't worth the extra money when the GTX 650 Ti Boost is sitting so close to it on the digital shelves. Nvidia is still having to play catch-up in the volume sector (in terms of actual gaming performance) and it's refreshing to see it making a real play with some quality technology for a decent price. Sadly for AMD, these new cards with the first GCN 2.0 GPUs aren't moving things forward enough. Simply dropping another 1GB of video memory onto this graphics card isn't going to help that new Bonnaire XT GPU's gaming chops.